Kenojuak Ashevak is one of Canada’s most acclaimed graphic artists. Her long list of achievements and honours is surpassed only by her stamina and good humour. Born on south Baffin Island at a camp area known as Ikirisaq, Kenojuak grew up traveling from camp to camp on south Baffin and in Arctic Quebec (Nunavik). As a young woman, she was married to Johnniebo and lived with him in various camps including Keakto, a scenic area seven miles from Cape Dorset. While still living at Keakto in the late 1950’s, both Kenojuak and Johnniebo first experimented with carving and drawing. They moved to Cape Dorset in 1966 in order for their children to attend school, and continued to work closely together until Johnniebo’s death. drawing entitled The Owl to be reproduced on their .86 cent stamp. Special commissions include the World Wildlife Print Portfolio released in 1978. In the same year, the Commonwealth Print Portfolio featured one of her works. Her art and life were the focus of the limited edition book entitled Graphic Arts of the Inuit: Kenojuak, published in 1981. In 1988, Via Rail Canada commissioned a large mural from Kenojuak for their Club Car series, which featured some of Canada’s most highly respected artists. Kenojuak’s print Nunavut Qajanatuk (Our Beautiful Land) was commissioned by Indian and Northern Affairs Canada to commemorate the signing of the Inuit Land Claim Agreement in Principle, in April 1990. To commemorate the signing of the Final Agreement early in 1994, Kenojuak conceived and hand-coloured a large and exclusive lithograph entitled Nunavut. Kenojuak has received many special honours over the years. She is now a Companion in the Order of Canada, which she originally received in 1967. In 1992, she was awarded Honourary Degrees from both Queen’s University and the University of Toronto. In 1996 she received the prestigious Lifetime Achievement Award at the National Aboriginal Achievement Awards Ceremony in Vancouver. 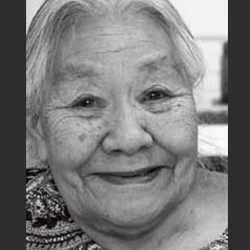 In the spring of 2001, Kenojuak was inducted into Canada’s Walk of Fame, and traveled with her daughter, Silaqi, to attend the ceremonies in Toronto. She is the first Inuit artist to be so honoured, and joins many other famous and accomplished Canadians. Kenojuak has traveled all over the world as an ambassador for Inuit art. In 1969, she and Johnniebo traveled to Ottawa to collaborate on a mural which hung in the Canadian Pavilion at Expo ’70 in Osaka, Japan. In 1980, she traveled to Rotterdam, Holland to be present at The Inuit Print exhibition which was opened by the Queen of the Netherlands. In 1991, she traveled to Soeul, South Korea to attend the opening of an exhibition of prints and sculpture, and in 1994, she was invited to open the exhibition Arctic Spirit: 35 Years of Canadian Inuit Art at the Frye Art Museum in Seattle, Washington. She also traveled to Ottawa in the fall of 1994 for the opening of Isumavut: The Artistic Expression of Nine Cape Dorset Women. In 2004, she was off to Germany to take part in cultural festivities celebrating the territory of Nunavut, and her contribution to Inuit graphic art. Her major stained glass commission was installed in the fall of 2004 at the John Bell Chapel at Appleby College just west of Toronto. 2008, she added to her list of honours the Governor General’s Award for excellence in the visual arts. Sponsored by the Canada Council for the Arts, she traveled to Ottawa in March 2008 with her daughter, Silaqi, to attend the exhibition at the National Gallery and events at the residence of the Governor General. She was back in Ottawa in 2009 to participate in events surrounding the 50th anniversary of the Kinngait Studios. Kenojuak is now 84 and the senior member of the Cape Dorset stable of graphic artists. Much loved and well respected, Kenojuak is represented by eight images in the 2011 print collection, including three particularly expressive and sensuous etchings that employ the sugar lift technique. Six-part Harmony (2011-16) may be the most ambitious print ever undertaken in the stonecut studio, given its complexity, size and the decision to use eight colours! It is truly monumental and a fitting tribute to Canada’s preeminent Inuit artist.